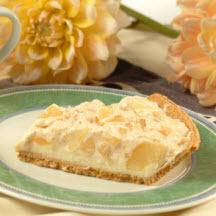 Rich and creamy, this no-bake apple pie will easily garner your family’s nod of approval. You may never bake another apple pie; this one is that good! Beat sugar, cream cheese and butter in a medium mixer bowl until smooth. Spread over crust. Combine escalloped apples, whipped topping and cinnamon in a medium bowl; spoon over cream cheese mixture. Refrigerate for one hour before serving.